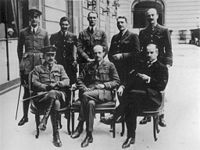 The Paris Peace Conference of 1919 was a conference organized by the victors of World War I to negotiate the peace treaties between the Allied and Associated Powers and the defeated Central Powers, that concluded with the signing of the Treaty of Versailles. The conference opened on January 18, 1919 and lasted until January 21, 1920 with a few intervals. It operated, while it lasted, as a world government . Much of the work of the Conference involved deciding which of the Allied powers would administer territories formerly under German and Ottoman rule, introducing the concept of "trusteeship" into international law - territories considered unable to govern themselves are entrusted to another state, whose mandate is to build the nation, creating the necessary foundations for self-determination and independence. Most of the decisions of which power received which territory, however, had already been made, for example, by the Sykes-Picot Agreement of May 16, 1917. As MacMillan points out, no one thought to consult the people of these territories about how they wished to be governed, with very few exceptions The results of this division of territory continues to impact the world today since it resulted in the British Mandate of Palestine and in the creation of Iraq, Syria, Lebanon and Jordan as nation states. The Conference also imposed huge reparations on Germany. Some countries, such as France wanted to impose more sanctions but neither the British Prime Minister, David Lloyd George, or the U.S. President, Woodrow Wilson, wanted to cripple Germany. Most historians argue, however, that the sanctions humiliated Germany and placed too great an economic burden on the country, making, as Lloyd George predicted, another war inevitable. The League of Nations was established at the Conference, the first attempt at an international intergovemental organization, with a brief to prevent war, settle disputes and improve peoples' lives across the globe. Just as World War I was believed by many to be the war that would end all war, so the Conference was meant to bring lasting peace. Unfortunately, it sowed seeds that resulted not only in World War II but in subsequent conflicts such as the Lebanese Civil War and the Arab-Israeli Conflict. Much was said about the need to protect minorities and create a more just world, but much of the business of the Conference involved nations protecting their own interests and trying to undermine those of others, such as the British vis-à-vis the French. Koreans, living under Japanese colonialism, for example, soon realized, after several Korean leaders traveled to Paris, that Wilson meant self-determination for former colonies of European powers, not existing colonies of Japan. Nor did they choose to grant their creation, the League of Nations, enough authority to become an effective tool, and having masterminded it, Wilson could not persuade his country to join, despite heroic efforts  Wilson wanted the people of the territories whose governance was being decided to have a say in their future. This was included in the terms of mandates but hardly any consultation took place prior to the Mandates being agreed upon. The Ottoman Empire (Treaty of Sèvres, August 10, 1920; subsequently revised by the Treaty of Lausanne, July 24, 1923). Also considered was the "holy grail" of Palestine, the Faisal-Weizmann Agreement (January 3, 1919). The Paris peace treaties, together with the accords of the Washington Naval Conference of 1921-1922, laid the foundations for the so-called Versailles-Washington system of international relations. The remaking of the world map at these conferences gave birth to a number of critical conflict-prone international contradictions, which would become one of the causes of World War II. The 'Big Four'—Georges Clemenceau, Prime Minister of France; David Lloyd George, Prime Minister of the United Kingdom; Woodrow Wilson, President of the United States of America; and Vittorio Orlando, Prime Minister of Italy—were the dominant diplomatic figures at the conference. The conclusions of their talks were imposed on the defeated countries. Map of the World with the Participants in World War I. The Allies are depicted in green, the Central Powers in orange, and neutral countries in grey. Germany and its former allies were not allowed to attend the conference until after the details of all the peace treaties had been elaborated and agreed upon. The Russian SFSR was not invited to attend. Prime Minister Borden fought successfully for Canada to have its own seat at the Conference; Canada was no longer simply represented by Britain. He also insisted that he be included among those leaders to sign the Treaty of Versailles. Germany was required, under the terms of the treaty of surrender, to accept full responsibility for the war. Germany was to pay 132 billion gold marks to the victors. Large tracts of Germany were to be de-industrialized and turned over to agriculture instead. Germany's allies were also charged with reparation. Germany was also to be demilitarized. However, in their case the amounts were never agreed nor were any sums ever collected. The U.S., which did not ratify the treaty, waived receipt of any payments. When Germany defaulted in 1923, French and Belgium troops occupied part of her territory. The amount owed was twice adjusted because Germany had difficulty making payments (1924 and 1929). Adolf Hitler repudiated the debt but post World War II reparations were resumed (in 1953). Class A were former territories of the Ottoman Empire considered almost ready to be recognized as nation states but which required the advice and assistance of a mandatory authority in the short term. These included Iraq and Jordan. These territories had not existed as distinct political units under the Ottomans and their borders were largely determined by colonial interests. Little attention was paid as to whether they were viable units in terms of local rivalries or different community interests, ignoring suggestions made by the British Arabist T. E. Lawrence. Class B were former German colonies considered to require longer term oversight, with the mandatory authority exercising more control and power. These included Tanganyika (now Tanzania), which went to Britain, and the Cameroons, which were split between France and Britain. 'Class C' were also former German colonies but these were to be governed as more or less an integral part of the territory of the mandated nation. For example, German New Guinea (which was merged with the former British colony of Papua and was already administered by Australia) became an Australia trusteeship. Palestine, because of support for creating a Jewish homeland within at least part of the territory, was given a separate mandate with specific objectives. The Balfour Declaration which, after the Conference was addressed by representative of the World Zionist Organization, including its President, Chaim Weizmann, later first President of the State of Israel, was ratified by the delegates, committed the League to establish in Palestine "a national home for the Jewish people." Palestine was mandated to British governance, although the mandate was not finalized until 1922 . The mandate also obliged Britain to ensure "that the rights and position of other sections of the population are not prejudiced" (Article 6). This mandate was bitterly opposed by the Arab world, represented at Paris by Emir Faisal, son of Sharif Hussein bin Ali (1853-1931) whose family had ruled the Hejaj since 1201 (see below). Ironically, since Arabs and Jews were both represented at the Peace Conference, the issues between these two people, deriving from rival territorial claims, remain unsolved. The Australian delegates were Billy Hughes (Prime Minister), and Joseph Cook (Minister of the Navy), accompanied by Robert Garran (Solicitor-General). Their principal aims were war reparations, annexation of German New Guinea and rejection of the Japanese racial equality proposal. Hughes had a profound interest in what he saw as an extension of the White Australia Policy. Despite causing a big scene, Hughes had to acquiesce to a class C mandate for New Guinea. The Japanese delegation was headed by Saionji Kimmochi, with Baron Makino Nobuaki, Viscount Chinda Sutemi (ambassador in London), Matsui Keishiro (ambassador in Paris) and Ijuin Hikokichi (ambassador in Rome) and others making a total of 64. Neither Hara Takashi (Prime Minister) nor Yasuya Uchida (Foreign Minister) felt able to leave Japan so quickly after their election. The delegation focused on two demands: a) the inclusion of their racial equality proposal and b) territorial claims for the former German colonies: Shandong (including Jiaozhou Bay) and the Pacific islands north of the Equator i.e., the Marshall Islands, Micronesia, the Mariana Islands, and the Carolines. Makino was de facto chief as Saionji's role was symbolic, limited by ill-health. The Japanese were unhappy with the conference because they got only one half of the rights of Germany, and walked out of the conference. It should be noted that the Japanese delegation did not realize the full ramifications of their proposal, and the challenge its adoption would have put to the established norms of the (Western dominated) international system of the day, involving as it did the colonial subjugation of non-white peoples. In the impression of the Japanese delegation, they were only asking for the League of Nations to accept the equality of Japanese nationals; however, a universalist meaning and implication of the proposal became attached to it within the delegation, which drove its contentiousness at the conference. The proposal received a majority vote on April 28, 1919. Eleven out of the 17 delegates present voted in favor to its amendment to the charter, and no negative vote was taken. The chairman, U.S. President Woodrow Wilson, overturned it saying that although the proposal had been approved by a clear majority, that in this particular matter, strong opposition had manifested itself, and that on this issue a unanimous vote would be required. This strong opposition came from the British delegation. Though in a diary entry by House it says that President Wilson was at least tacitly in favor of accepting the proposal, in the end he felt that British support for the League of Nations was a more crucial objective. There is not much evidence that Wilson agreed strongly enough with the proposal to risk alienating the British delegation over it. It is said that behind the scenes Billy Hughes and Joseph Cook vigorously opposed it as it undermined the White Australia Policy. Later, as conflicts between Japan and America widened, the Japanese media reported the case widely—leading to a grudge toward the U.S. in Japanese public opinion and becoming one of the main pretexts of Pearl Harbor and World War II. As such, this point could be listed among the many causes of conflict which lead to World War II, which were left unaddressed at the close of World War I. It is both ironic and indicative of the scale of the changes in the mood of the international system that this contentious point of racial equality would later be incorporated into the United Nations Charter in 1945 as the fundamental principle of international justice. The Japanese claim to Shandong was disputed by the Chinese. In 1914 at the outset of First World War Japan had seized the territory granted to Germany in 1897. They also seized the German islands in the Pacific north of the equator. In 1917, Japan had made secret agreements with Britain, France and Italy as regards their annexation of these territories. With Britain, there was a mutual agreement, Japan also agreeing to support British annexation of the Pacific islands south of the equator. Despite a generally pro-Chinese view on behalf of the American delegation, Article 156 of the Treaty of Versailles transferred German concessions in Shandong, China to Japan rather than returning sovereign authority to China. Chinese outrage over this provision led to demonstrations known as the May Fourth Movement and China's eventual withdrawal from the Treaty. The Pacific islands north of the equator became a class C mandate administered by Japan. Italy had been persuaded first to join the Triple Alliance and then to join the Allies in order to gain land. In the Treaty of London, 1915, they had been offered the Trentino and the Tyrol as far as Brenner, Trieste and Istria, all the Dalmatian coast except Fiume, full ownership of Albanian Vallona and a protectorate over Albania, Aladia in Turkey and a share of Turkish and German Empires in Africa. However, by the end of the war the allies had made contradictory agreements with other nations, especially in Central Europe and the Middle-East. In the meetings of the "Big Four" (in which his powers of diplomacy were inhibited by his lack of English) the Great Powers were only willing to offer Trentino to the Brenner, the Dalmatian port of Zara, the Island of Lagosta and a couple of small German colonies. All other territories were promised to other nations and the great powers were worried about Italy's imperial ambitions. As a result of this Orlando left the conference in a rage. The Racial Equality Proposal put forth by the Japanese did not directly conflict with any of these core British interests. However, as the conference progressed the full implications of the Racial Equality Proposal, regarding immigration to the British Dominions (specifically Australia), would become a major point of contention within the delegation. After Woodrow Wilson failed to convince Lloyd George and Georges Clemenceau to support his Fourteen Points, the conference settled on discussing the possibility of a League of Nations. After most points were agreed on, the written document detailing the League was brought back to the U.S. to be approved by Congress. Congress objected only to Article 10, which stated that an attack on any member of the League would be considered an attack on all members, who would be expected to support, if not join in on the attacked country's side. Wilson, disheartened, returned to Paris in March after all the diplomats had reviewed the League outline with their respective governments. Without the approval of Congress, Clemenceau noted Wilson's weak position and furthered the interests of Britain and France, opposed by Wilson. Germany was forced to accept full blame, which the new German government disliked. Germany was being asked to accept all responsibility, lose all colonies and some homeland, and to pay war reparations to the Allies of World War I US$32 billion or 133 billion gold marks; later reduced to 132 billion marks. Wilson would not sign these treaties, and so the United States signed separate treaties with Germany, approved by Congress. ↑ see Danderson Beck, "Wilson and the League of Nations," Wilson and the League of Nations San.Beck.org. This article includes the 14 points presented by Wilson at Paris which set out his vision for peace, and the five principles that informed the Covenant of the League of Nations. Retrieved 13 May 2007. Beck describes Wilson's heroic effort to convince the US Congress to ratify the Covenant. Although the US did not join, under the terms of the Covenant, Wilson convoked the League’s first meeting. ↑ "The Palestine Mandate of the League of Nations, 1922," Mideast Web The Palestinian Mandate of the League of Nations, 1922 Retrieved May 12, 2007. ↑ Naoko Shimazu. Japan, Race and Equality: The Racial Equality Proposal of 1919. (Nissan Institute Routledge Japanese Studies Series) (London: Routledge, 1998), 115. ↑ The Hussein-McMahon Correspondence, Jewish Virtual Library The Hussein-McMahon Correspondence Retrieved May 12, 2007. ↑ C. T. Evans, and A. Clubb, "T.E. 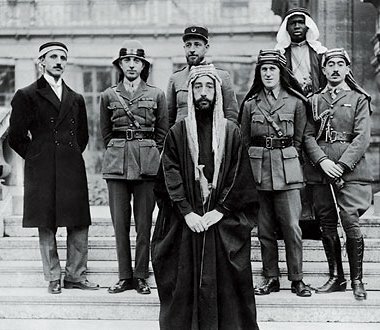 Lawrence and the Arab Cause at the Paris Peace Conference," Northern Virginia Community College T. E Lawrence and the Arab Cause at the Paris Peace Conference" Retrieved May 12, 2007. Otte, T. G. and Margaret Macmillan. 2001. "Peacemakers - The Paris Peace Conference of 1919 and Its Attempt to End War." TLS, the Times Literary Supplement. No. 5143: 3. T E Lawrence's Middle East Vision at NPR includes Lawrence's "peace map," an alternative division of the region taking note of local loyalties and sensitivities. National Public Radio. History of "Paris Peace Conference, 1919"
This page was last modified on 15 January 2019, at 16:50.